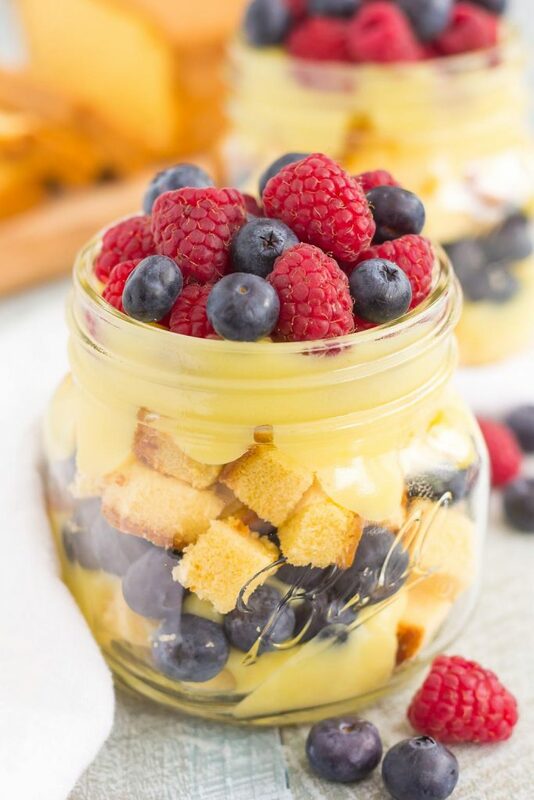 This Berry Vanilla Pudding Pound Cake Trifle is filled with creamy, whipped vanilla pudding, buttery pound cake chunks, and fresh blueberries and raspberries. It’s layered together to create an easy summer treat (perfect for July 4th) that’s ready in no time! We’re just one week away from July 4th…how can that be? When I was younger, the 4th of July always stood out as the halfway point of summer to me. Before this time, it was still early summer, which meant that I had days upon days on endless fun stretched ahead of me. When July 4th hit, it signified that summer was halfway done, but, it was still full of adventure before school started. Even though I’m fully grown and haven’t been in school for quite some time now, I still think of the 4th as the halfway point of summer. I still even get that back-to-school feeling when August rolls around! So, I’m squashing the feeling of summer being almost halfway over with…which, really, it’s not! Instead, let’s just focus on some patriotic treats today. Sound like a plan? And speaking of plans…do you have anything fun planned for the holiday? I’m looking forward to the three day weekend and watching some fireworks! Along with this Berry Vanilla Pudding Pound Cake Trifle, of course! If you’ve been hanging around here long enough, you know that easy treats are the name of my game. 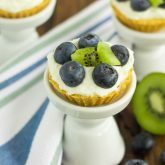 So, it only seemed fitting to share with you a simple, yet festive treat that just screams summer and 4th of July fun. 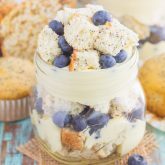 This Berry Vanilla Pudding Pound Cake Trifle is filled with creamy, whipped vanilla pudding, buttery pound cake chunks, and fresh blueberries and raspberries. It’s layered together to create an easy summer treat that’s ready in no time! I’m a total sucker for the boxed, instant pudding, which is what I used in this recipe. You can definitely make your own pudding, but to keep things simple, I opted for vanilla. My favorite kind, by the way. And it’s not just any vanilla pudding, it’s mixed together with a creamy whipped topping. It’s gives the pudding a little something extra special. And that pound cake…I used Sara Lee butter pound cake that you can find in your grocer’s freezer. I’ve mentioned this before (and I’m not getting paid to say this), but Sara Lee pound cake is the best. My favorite! It reminds me of my childhood. Of course, homemade pound cake is even better, but again….we’re going for easy today! The blueberries and raspberries create a deliciously sweet flavor and are perfectly festive for the 4th. 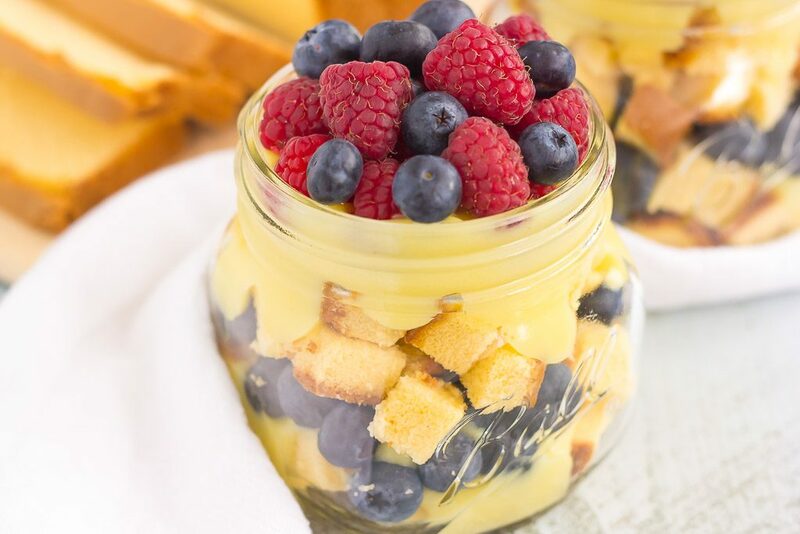 Layer everything together and you have the perfect, Berry Vanilla Pudding Pound Cake Trifle. I chose to serve this in mini mason jars for ease and cuteness, but feel free to use a regular trifle dish. This simple dessert is impressive enough for parties, get-togethers, and for watching the fireworks on July 4th. And I guarantee you’ll be making this treat all year long! Looking for more summer desserts? I’ve got you covered! 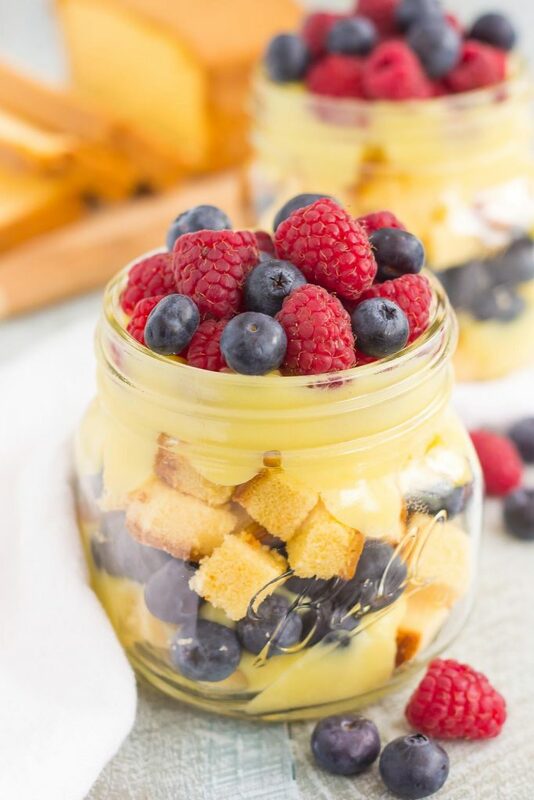 This Berry Vanilla Pudding Pound Cake Trifle is filled with creamy, whipped vanilla pudding, buttery pound cake chunks, and fresh blueberries and raspberries. It's layered together to create an easy summer treat that's ready in no time! In a large bowl, whisk pudding mix and milk for 2-3 minutes, or until starts to thicken. Gently fold whipped topping into pudding until just combined. Set aside. Place about ¼ cup of pound cake cubes into the bottom of a glass jar or trifle. Spread a layer of pudding mixture on top of pound cake. Add about 1/4 cup of blueberries on top of pudding, followed by more pound cake cubes, another layer of pudding, and then top the pudding with about 1/4 cup of raspberries. Repeat with rest of jars. If using a medium trifle dish, repeat the layering process, ending with pudding. Mmm...this is the perfect dessert in my opinion! I love trifles, I love when a recipe comes together easily, and I love anything in a jar! Beautiful, Gayle! Now if only you could bring some to me TODAY! I might have mentioned this before, but the Sara Lee pound cake holds a special place in my heart. This looks so refreshing and happy! And thank goodness the east coast skews summer later to the first of September. Our summer is just getting started here! I absolutely love Sara Lee Pound Cake too, it's the best! Thanks for the kind words, Mir! I seriously can't believe we're almost to the 4th either!! Totally the highlight of my summer. ;) This pound cake trifle is seriously SO perfect for the holiday! I love how adorable they look in the mason jars!! I'm not quite sure how it's already almost the 4th of July. I feel like this year has just totally flown by. Looks like we were on the same wavelength with the trifles today! I love those beautiful layers and that you used pudding in them too. What a gorgeous treat! Isn't it crazy how early stores start putting out Christmas decorations? I hate that! But your are so right, we have a lot of summer left! I've never heard of McCain cake, but that does sound delicious. Thanks for the kind words and pin, friend! Oh dang, is the summer really almost half over? Say it ain't so, Gayle! Rats... and I thought it was just starting! Okay, I'm all for squashing that feeling with this gorgeous pound cake trifle. The bounty of berries in this dessert is just everything. YUM! Hoping you have a great start to the week G! Pinning, of course! I guess summer isn't really half over, but it kind of feels like it once the 4th hits! Thanks for the trifle love and pin, Demeter! Yes, let's focus on the fun and festive treats instead of the end of summer- I'm not nearly ready for that yet! You make the best easy desserts, Gayle! These berry trifles are beautiful, and I know they would be a huge hit with my family! Oh my gosh, I don't think I realized how close 4th of July was until I just read your first sentence. Eeek! I need to get moving on some red, white and blue recipes! :-). Love these trifles. Individual desserts have my heart. Swoon. It's ridiculously close to the 4th and I'm nowhere near ready for it! I just made trifles like this for Mother's Day and wondered why I don't it more often? They're so fun and you can't beat individual desserts! I grew up on Sara Lee pound cakes too -- I haven't had one of those in so long! They would certainly make this a lot easier, and these are just perfect for the 4th! What a tasty trifle! And I love the presentation in the jars. How fun. Whenever I see back to school supplies in stores I still feel a little sad for kids. I always remember how angry I used to get about how they'd stock the shelves with that stuff in about July. Haha. Happy 4th! Haha yes! It's just too early to start thinking about going back to school. Thanks for the kind words, Amanda! Gayle, I love this simple yet beautiful and delicious dessert!!!! love the vanilla pudding and berries!!!! a perfect summer treat! 4th of July always seems to be the halfway mark for me too. This berry pudding dessert looks perfect for the celebration. Who doesn't love easy and delicious? And that Sara Lee pound cake is to die for! Easy and delicious is the best, right? Thanks, Rachelle! This is so pretty! I love all the colors. Thanks for the trifle love, Megan! These trifles are so festive and fun, Gayle!! Love that you combined the pudding with whipped topping! I bet that makes it so airy and light! And serving these in mini mason jars is genius! Pinned! Cheers, friend! P.s. I can't believe the 4th is next week either! Crazy how fast this year is going! Thanks for the trifle love and pin, Cheyanne! Sounds like you will have a wonderful weekend, Keri! Thank you for the kind words! Thanks, Annie! And yes (yikes!) Christmas will be here before we know it! Yup, July 4th always feels like the halfway point of summer for me too! And I cannot believe it's almost here! Loving the sound of these pudding trifles! So pretty with all the berries! Time is going by WAY too fast! Thanks for the kind words, Ashley! seriously how come it's almost 4th of July? Crazy! the trifles look so pretty and delicious! Love pound cake and this trifle looks so delicious! Perfect for the holiday! I can't believe it is almost 4th of July! This year is going by way too fast! I can't believe June is almost over! 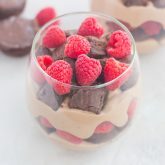 These trifles would be perfect for 4th of July or any summer party!! So adorable and pretty! Thank you, Kelly! I can't believe June is almost over, either! 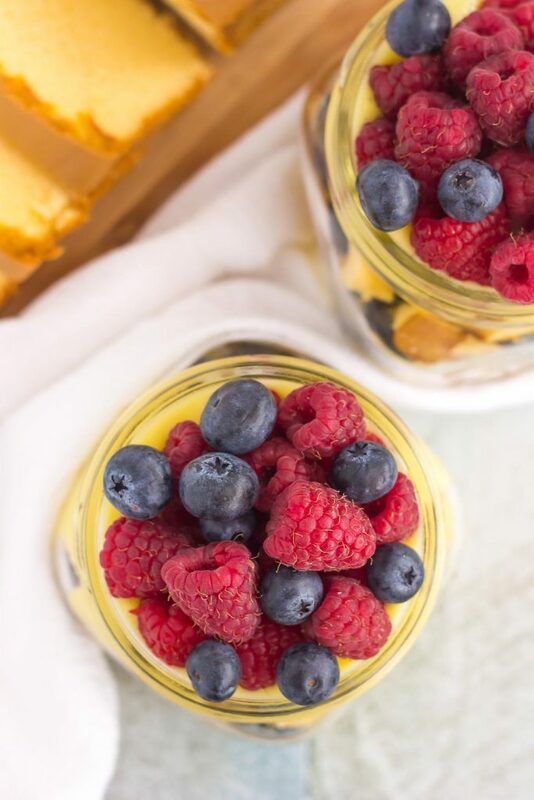 These look so deliciously easy to make (which is such a plus when it comes to summer desserts) and I love the fun touch of serving it in a mason jar! Delicious! This looks beautiful! This is one of those recipes everyone needs on hand for when you need to have a beautiful but easy dessert! That is so strange to me -- here July 4 our summer is just beginning! School here runs right until the end of June (sometimes the 26th or 27th if it's an earlier year), and we don't go back until after the long weekend in September! Either way, this year I feel like we're getting an extra, EXTRA long summer with the way the weather has been and I'm not complaining! These are so fun and perfect for quick parties! Love those mini mason jars! What an easy and delicious 4th of July dessert! Thanks, Christin! I love making desserts in mini mason jars! It's hard to believe that July is just a couple days away. This year is whizzing by! I love this little mason jar trifle. It would be the perfect dessert to carry to a cookout! Seriously, where did the time go?! 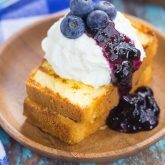 I love pound cake and berries together! This looks amazing and something I will totally be consuming all summer long! Thanks for the trifle love, Michelle! This looks like such a good summer dessert, with the fresh berries and so much goodness all together in the layers!